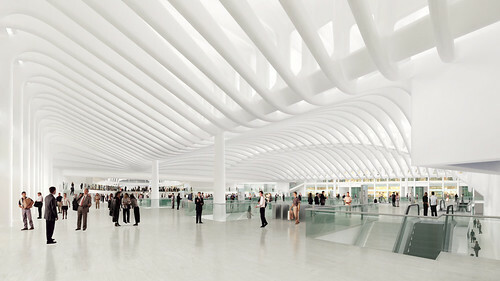 This week, the Port Authority of New York and New Jersey (PA) and Santiago Calatrava released renderings of the scaled back World Trade Center Transportation Hub. Gone is the sweeping column-free span, originally envisioned by the Spanish architect known for his expressionistic structures. Tapered columns have been added, which the Port Authority and the architect argue will speed along construction and reduce the amount of steel needed to complete the project. The skylights, which were to bring natural light into the mezzanine, have also been eliminated. This is only the latest compromise at the WTC site. As Alec Appelbaum wrote on October 2, a new report from the PA laid out plans for a revised timeline and simplified construction, including at the hub. When the report was released, the PA pledged to open the memorial in time for the tenth anniversary of the attacks. By Tuesday, Christopher Ward, executive director of the PA, speaking at a City Council hearing, pushed back the schedule for the public opening of the memorial to 2012. 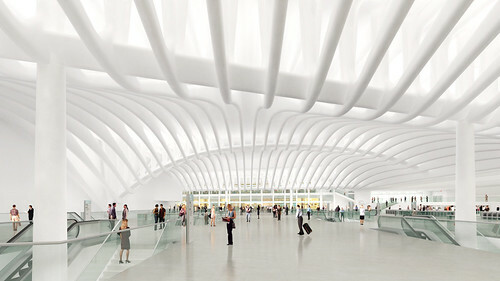 Calatrava has often said the new hub would rival Grand Central Terminal as one of New York’s grandest public spaces. As his vision has steadily been eroded, it’s time to ask if the space will be closer to the underground interior of Pennsylvania Station.